Professional whitening ingredients for 2 shades whiter teeth! 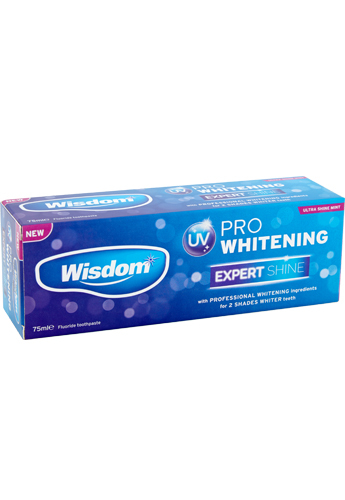 Wisdom UV Pro Whitening Expert Shine toothpaste contains PROFESSIONAL WHITENING ingredients to effectively remove and prevent stains, delivering up to 2 SHADES WHITER TEETH*. The advanced micro polishing formulation is gentle on enamel and safe for daily use, working INSTANTLY to remove stains without tooth wear for an expert shine. Ingredients: Sorbitol, Aqua, Hydrated Silica, Pentasodium Triphosphate, Sodium Bicarbonate, Cocamidopropyl Betaine, Aroma, Cellulose Gum, Sodium Fluoride, Sodium Saccharin, Hydrogen Peroxide, Cl 77891. Specially formulated with stain prevention technology. 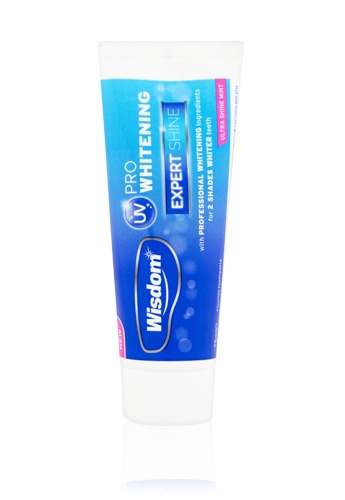 Part of the Wisdom UV Pro Whitening Expert oral care range.